Note the very distinctive white flash on the birds wings, both Male and Female have a white speculum. The Male Velvet Scoter is a dark black bird with a white speculum, white eye markings and a wedge shaped head. It's neck is much thicker and heavier than a Common Scoter and the white on the wings in flight is very distinctive, although not always obvious at rest. The Velvet Scoter when seen in the UK is usually mixed with flocks of Common Scoter. The Velvet Scoter breeds on remote tundra and spends the rest of it's time at sea. Breeds in Scandinavia and Winters around the coast down as far as the Mediterranean. In the UK it is most often seen off the East coast in Spring and Summer where around 2500 birds are recorded per year, with a large proportion being birds on passage south or North. 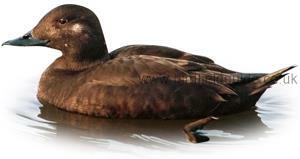 Population numbers of Velvet Scoter are falling and it is a species of concern. The female Velvet Scoter is difficult to identify at a distance, it's profile is helpful: Wedge shaped bill and head, bill has a long thin tip and the neck is thick and heavy looking. If the wings are opened the white speculum will help confirm identity. Useful video of a Velvet Scoter flying. Mixed flocks of Common Scoter and Velvet Scoter are typically seen 'rafted' in large flocks well offshore. 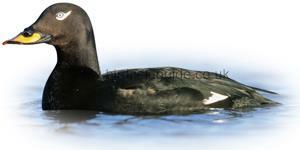 Scoter tend to fly in straight lines parallel to the shore, often in large numbers of different species. This Male Velvet Scoter when seen up close is easily identified, however he is almost identical to the much rarer White-winged Scoter, pay particular attention to the bill colour and shape to differentiate. 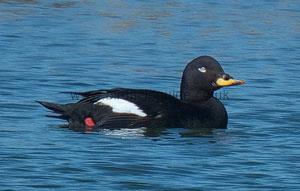 The Velvet Scoter's bill is more yellow and the nostril is less pronounced.